The general manager of the five-star Steigenberger Wiltcher’s hotel on Avenue Louise in Brussels first discovered a taste for hospitality as a child at his parents’ delicatessen in Paris. Michel Cottray has gone on to enjoy a 35-year career in the industry via 10 different countries Hong Kong, Greece, Monaco, Saudi Arabia, Australia, and – as of three months ago – Belgium. Cottray talks to ING’s Dave Deruytter about adapting to new cultures, immersing in new communities, and responding to the challenges of a changing world. What does it take to make a success of a career in the hotel industry? We work hard in this industry; it’s a 24/7 business that never stops. You get used to that, but it definitely needs a lot of flexibility to make it work. I would say I’m always on stage. The hotel business is like a big theatre: we all have roles to play and it needs a lot of rehearsals. And guests are not mere spectators but are also part of the casting. Being a people business, anything could happen. We are not in manufacturing, where all the pieces are alike. For example, I can see the pastry chef coming along here with homemade pastries, but if the waiter doesn’t serve them with a genuine smile, then our efforts are for nothing. We are all here to represent an art de vivre. The Wiltcher’s is a landmark hotel in Brussels. What challenges does that bring? This hotel is an iconic place in Brussels, but even if it’s well known and has a prime location, you always need to keep things fresh, not only following trends but also trying to do things a bit differently. We want to develop the leisure business; portray an image that it’s not only a hotel for delegations. We’re saying why not come for the weekend with your family and have fun staying with us. We want to break this very formal, severe image we have. There is a lot of work to be done in the hotel industry in general since the Paris and Brussels terrorist attacks. 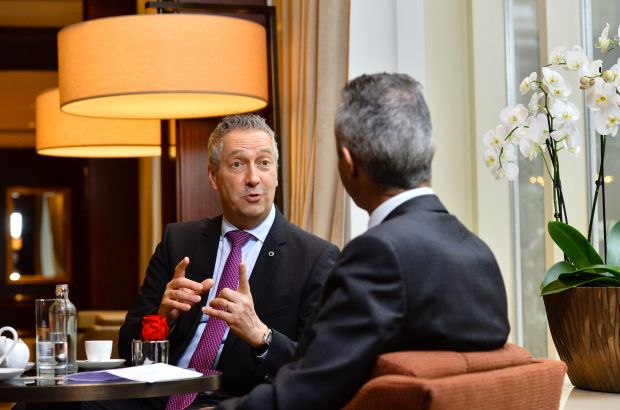 I was in Paris in 2015, managing Le Meridien Etoile, and whatever you do, you have to ensure the business survives. In a sense this is a good time for me to be here. All indicators now seem to be positive – though there is always the risk of something unexpected – and Brussels is already showing signs of comeback. Business went down dramatically in late 2015 and 2016, between 20 and 40%. That’s a lot of money. But Paris is now back to where it was pre-terrorism, so why wouldn’t Brussels do the same? I think it will. How has the industry responded to those atrocities? For us there is increased vigilance and communication and we are taking preventive measures, but we have to remain open to the world. Brussels has realised it cannot be immune to this sort of thing, and we are now conscious that it can happen anywhere, to anyone. Was Brussels the number one target for an attack? Of course not, but I think it was the first time in Belgium that people faced the reality that they were really in the action, and not in a good way. It made the country understand that they have to take measures. On the street you can see a reinforced security presence, which is a very costly exercise, but it’s a good thing. Some people don’t like to see it, but you can’t say the attacks were a one-off and it will never happen again. I faced the same situation when I worked at the Westin Resort in Bali, in 2002, when there was a huge bombing and 200 people died. We knew there were things happening in the region, in Jakarta, for example, but Bali was presenting the message to the world that it couldn’t happen there, on the Island of the Gods. But it can happen anywhere. What does being an expat mean to you and your family? I’m very much from Paris, but I turned into an expat. I never really dreamed of living outside France; it came with the job. Being an expat brings richness of experience: different countries, religions, languages, and of course food. We’ve lived in Thailand, Australia, Saudi Arabia, each with their own fantastic style of food. We lived in Germany too; in terms of gastronomy it’s changed a lot in the past 30 years. Food is like a red line running through my experiences! Our kids grew up in this environment, and not surprisingly they live abroad now. Though really, what is abroad for them? I’m French, my wife is German, but the children’s home is really our family. My son is 28, he’s in Santa Monica, and our daughter is 25 and lives in London. They have dual nationality, but growing up the way they did, they are truly global. For me, a good cycle should be about three years, to really appreciate the location and to do things that will hopefully bring results. You have to adapt both privately and professionally. It takes time to find things like the right doctor, the best butcher, the reliable garage, to sort out insurance, to get to know people. Then in the second year you start to enjoy the new contacts you have made, not very deep but some connections, and the third year is when you start to feel comfortable about your new home. And it’s much the same on the professional side. It’s not my style to arrive somewhere and change everything in the first month because it should be done differently. You need time to look around and appreciate the differences. You might see weak points and how you could do a better job, but you’ll be in your second year before you start to put things in place. In the third year, you start to appreciate or not the results of the changes you’ve made. As a seasoned expat, what’s your advice to newcomers? To really appreciate the destination and to be part of the community, you can’t live 20km out of town. So we looked for an apartment close by, and in fact we live 300m from here. We know it’s where the action is – not that we’re that young and out every night – but we can really get the feel of the city very quickly. I’ve seen some suburbs of Brussels that are lovely, with fantastic houses and big gardens and so on, but it’s not for us. We don’t want to be somewhere very quiet, hearing the birds in the morning (even though I love birds!). Instead we hear the tram every day, in front of our house, and I love it. To me it’s the sound and the smell of Belgium. Even at 6.00 in the morning, hearing the clatter of the trams doesn’t disturb me at all. We love discovering new things. When I started out, you couldn’t find information about places. At the time we moved to remote Phuket in Thailand 25 years ago, there was nothing. Today anyone who wants to emigrate to Bhutan can just google it and within half a day they’ll know where the best school is and how much a litre of milk costs. When we left Germany to go to Phuket, we had no clue about schooling, about hospitals, and so on. Travelling and working abroad should be an adventure. Don’t go crazy, but do let yourself be surprised. You have to be open to whatever may come your way. Not surprisingly, I enjoy travelling and tourism. I like to keep moving. I love food, not necessarily fine dining, but looking for the latest places, trying something original. Besides that, I enjoy simple things like walking with no particular destination. I can’t wait for the better weather to come so we can ride our bikes and explore a bit further afield. I also have an old-timer car, a 1967 Citroën DS in perfect condition. My next big job is to get it fitted with Belgian old-timer plates, and I’m looking forward to driving that round the Belgian countryside, going to Bruges or Namur or Bastogne. This is an underestimated country, and I want to make my own impressions and opinions about it. Are you able to relax when you travel, or are you always looking for new ideas? I have calmed down! Now if I stay in a hotel I may see something that catches my eye, but unless it’s really interesting I won’t comment as I used to. At the end of the day, I care less and less what the others are doing, good or bad. I’m still competitive, but when you are younger and new to it all, you look for inspiration in everything. Now I might find inspiration in something I see, but I’m not going to let it ruin my stay.